The Royal Navy’s newest aircraft carrier, HMS Queen Elizabeth, has had a pub installed in time for its maiden voyage to the US later this month. Officially opened on 13 August, the ‘Queen’s Head’ was installed by Wiltshire-based brewery Wadworth in the Warrant Officers’ & Senior Rates’ Mess aboard the carrier with additional funding from the Royal Navy Royal Marines Charity (RNRMC), Nuffield Trust, BAE Systems and RN Rebalancing Lives. Featuring a hand painted pub sign of Queen Elizabeth I, the bar stocks a range of bottled Wadworth ales including ‘6X’ and ‘Swordfish’ as well as ‘Carrier Ale’ a 3.6% beer that was brewed specially for the commissioning of the new carrier by Queen Elizabeth II last year. 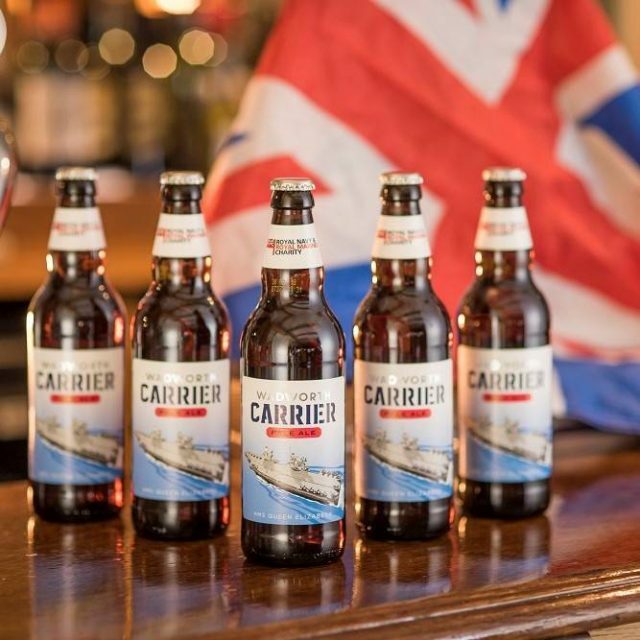 For every bottle of Carrier sold on board, five pence will be donated to the RNRMC. Although the Royal Navy ended its traditional rum (or ‘grog’) ration on 31 July 1970 – a date now remembered as ‘Black Tot Day’ – the service is not entirely ‘dry’ as the US Navy is though, naturally, there is a line and limit to when and how much is allowed. Rum has perhaps the greater association with the Navy in the popular imagination but in fact before the introduction of rum sailors were given a beer ration. At the end of the Second World War, the Royal Navy oversaw the conversion of several old minelayers into floating breweries. Their mine laying duties completed, the plan was for several to be converted into amenities ships to support the British Pacific Fleet. Sent to Vancouver for conversion, as well as cinemas and a canteen, each was to hold a brewery with the capacity to brew 250 barrels a week. 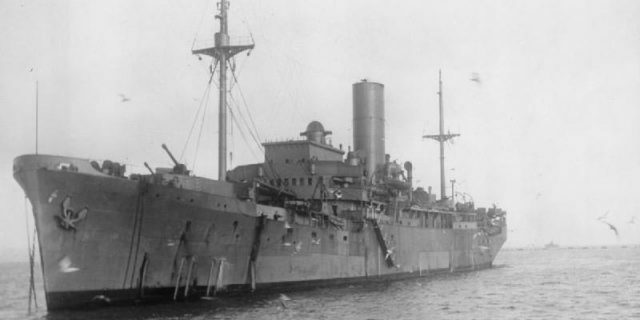 In the end, however, because of the end of the war just two ships were converted, HMS Menestheus and HMS Agamemnon, and only one put to sea – Menestheus in mid 1945 – which was proudly touted by the press as “the world’s only floating brewery”. Its equipment worked perfectly and the ‘mild’ it produced under the direction of head brewer Lieutenant Commander George Brown of the Royal Naval Volunteer Reserve was sold for 9d (old pence) a pint and was served in the Davy Jones bar. Although its time as a brewery was short-lived, the beer it produced was eagerly consumed by the sailors and soldiers in the Asia-Pacific theatre when it did a tour of Yokohama, Kure, Shanghai and Hong Kong on its way back to the UK in order to be decommissioned from the Royal Navy and reincorporated into the Blue Funnel Line in 1946. As well as our rum ration at 1200 we were allowed 2 cans of beer per man a day.Happy days.